Happy Saturday to ya'll! Well, I am hosting Our Creative Corner this week. And I have to admit, I love coming up with some fun challenges for you. For those who know me, know that I am a girl-y girl. I love all things pink, and little feminine touches of ribbon, buttons, bling, and pearls. But I have girl friends who don't like pink. Crazy, I know. So, for this week's challenge, I thought we could make something pretty for those who aren't a fan of pink. Make a paper craft item (card, layout, scrapbook page, 3-D item, etc) using any shade of blue, add some texture (ribbon, fabric, floss, etc) and something metal (push pin, charm, brad, etc). And the twist is to add a smidge of pink. Any shade of pink. And not too much. (if you need a number, make it 1/5 or less pink.) To get some extra inspiration, please stop by Our Creative Corner and see what these super talented ladies have created. You won't be disappointed! And if this seems too busy for your taste, I made another sample to show that less can be more. Both cards were made from my scrap box. I'm on a thrifty kick these days. Please join us for this fun and create challenge! What a great way to use up scraps! I need to do that sometime. Your cards are lovely - I especially love the first one with all the baubles on it! Thanks for a fun challenge that really made me think! loving the Little Sewing card! Gorgeous. Cheers! 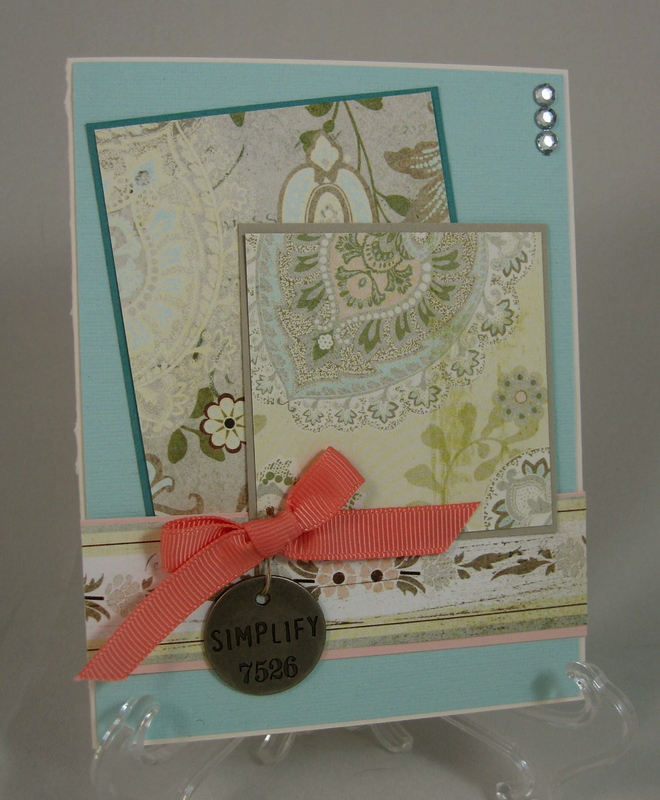 Both cards are great, Sharon, even more so that you made them using scraps. Those kind are so gratifying! 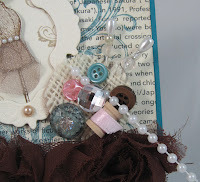 I really love the sewing card and how you've dressed the dress form and added all the 3D embellies on the right hand side. This was a thought-provoking challenge! 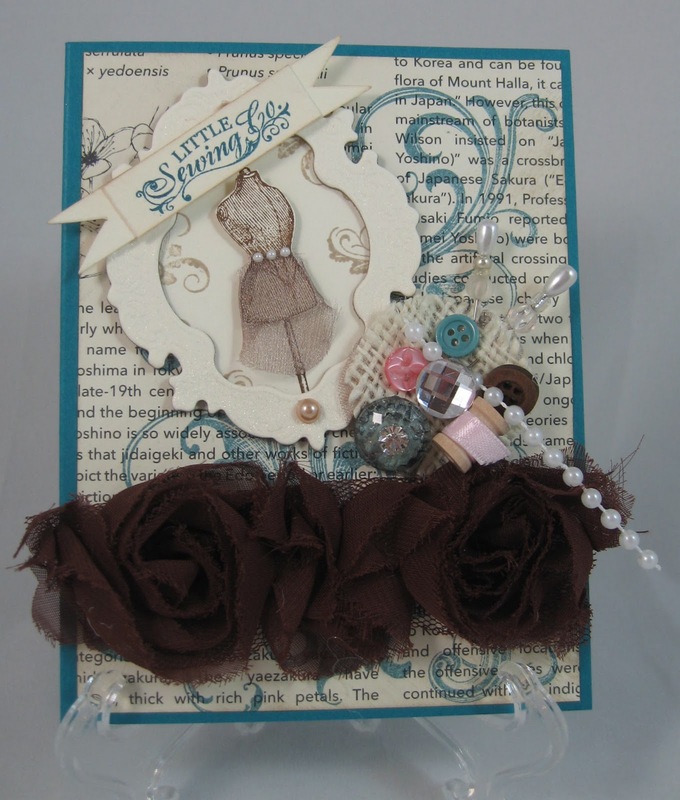 Wow ... your cards are both fabulously beautiful Sharon ... if this is what you create with scraps, my goodness you have some serious talent!!! Thank you for your challenge this week ... it certanly tested me in every way!!! Both of your cards are absolutely delightful, Sharon, but my favorite is the first one. Of course you know I'm hooked on anything with a dress form and I love that sweet patch of white burlap and the buttons! And I really like how you stamped on the text DP. Super challenge this week. I didn't think I was going to like this one, but ended up loving it - LOL! Such a perfect card Sharon, I so love that first one, all the wonderful extras make it a winner!! Loved this challenge Sharon, sorry I am so behind on my commenting! !